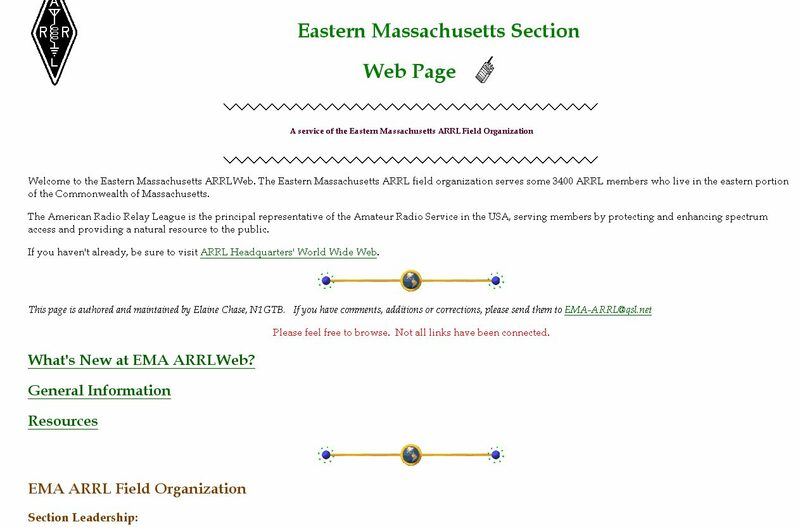 Shown here is a snapshot of the old Eastern MA ARRL web site circa December, 1998. At the time, our site was hosted by QSL.NET. The site consisted of static HTML pages. Elaine Chase, N1GTB, a former ACC for Eastern MA served for many years as the site’s webmaster. In December, 2008, ema.arrl.org switched to a Drupal content management system. The site used Drupal until February, 2018. It underwent a complete redesign and a migration to WordPress. Much of the original content from twenty years ago can still be viewed. One may view archives from other dates of this site–or any other internet site–by visiting http://www.archive.org.